A thief burst into tears, on Saturday, after he was nabbed alongside two others, while stealing some solar panels belonging to MTN in Atan-Otta, Ogun State. According to Crimepuzzle, the suspects are identified as kehinde Yahya, 36, Akeem Ademola, 36 and Taofeek Oladele, 36. . 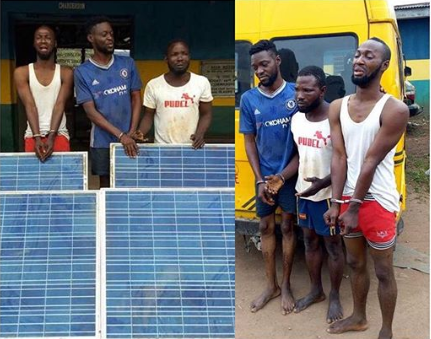 While confirming the arrest, the state Police PPRO, DSP Abimbola Oyeyemi, said the entire 12 solar power panels and a Danfo bus, were recovered from the hoodlums.